Uglyworld #903 - The Finest Pilot In The Universe (357-365), originally uploaded by www.bazpics.com. 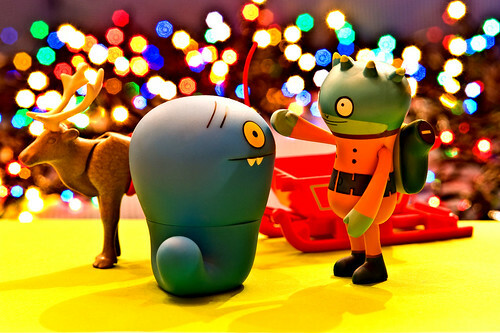 Noupa did his best to reassure Uglyworm that there was no finer pilot in the entire universe than he to ensure that the reindeer and sleigh make it to the North Pole by tomorrow night ready for Santa to start make his Christmas deliveries. "Says hellos to Babo froms us all toos when you gets there! ", he added as Noupa left on his journey. p.s. Babo called this morning to let you all know that Santa received your wishlists and has approved them all without any issues, and then he discoved that the reindeer and sleigh were still here in Aachen and not already on their way to the North Pole...!! !